From left: Chefs Tim Ma, David Guas, and Ruben García were asked to rethink the traditional school lunch menu. Spooning rosemary-infused honey onto apple slices was getting every ounce of Lucia García’s attention, until her father reminded her of the time. “Lulu, you need to go faster,” Ruben García said, lightheartedly, reminding his 9-year-old sous chef that their meal would need to be plated in a few minutes. The apples were just one component of a build-your-own-tacos dish featuring stewed beef, black beans, radishes and a kale-and-sweet-potato salad. Chef Ruben García’s build-your-own-tacos dish was enjoyed by both kids and grown-ups alike. The dish will not be on the menu at Minibar, where García directs the Michelin two-starred kitchen’s research and development. But something like it could end up on a school lunch tray in the DC area, where food service programs are improving at a slow-but-steady clip. Dozens of nonprofits and a growing number of chefs are focused on improving the food that is offered in schools, which, for many children, could be the most nutritious meal they’ll get each day. But the problems plaguing school lunch—the struggle to turn healthful ingredients into dishes kids will eat, often on less than $2 per meal—still feel so entrenched, so difficult, that we wanted to find a new way to tackle them. Inspired by the work of Dan Giusti, who left Copenhagen’s New Nordic powerhouse restaurant Noma to overhaul school lunch programs in Connecticut with his company Brigaid, we decided to host a local chefs cook-off. We asked a trio of DC chefs—each of whom has kids in public schools—to rethink school lunch through a friendly competition. No school lunch would be complete without an iconic colorful tray. Just before the start of the school year, we invited García along with chefs David Guas and Tim Ma to come cook their meals in the recently renovated cafeteria and demonstration kitchens at Francis Stevens School Without Walls in West End. Here, FRESHFARM Markets’ FoodPrints program is helping students create meals with produce they grow in a sprawling garden out front, weaving the experience throughout the school’s curriculum. Giusti, who’s hosted larger versions of such a competition, tried to warn me that—with chefs cooking for the first time under the strict cost and nutrition constraints of a school lunch—the food might not be great. We asked the chefs to prepare just 20 portions, compared with the hundreds a school kitchen might churn out for a day’s lunch, so we gave them some wiggle room on costs, assuming they wouldn’t have the same economies of scale. The goal was close to $2 and no more than $5 per meal (the less they spent, the more points they got). The DC chefs said finding protein options that would be both delicious and inexpensive was perhaps the biggest challenge. Chef García with his daughter, Lucia. We asked the chefs to meet the federal nutrition guidelines for an elementary school lunch (though we didn’t measure things like sodium), including a serving of fruit, vegetable, whole grain and at least one ounce of meat or meat alternative. You read that right—one ounce is all that’s required for the youngest grades, though Michele Ballard, wellness director for SodexoMAGIC, the food service provider for more than 100 DC public schools, said their cafeterias often serve more. The school district is now in the early stages of adopting the Good Food Purchasing Program, which analyzes the sources of school meals based on five criteria, and works to improve them, and would be the 10th school system in the country to do so. Part of that same federal grant will help FoodPrints expand its program to 10 schools in the District. The nonprofit also is working with chefs from New York City–based Wellness in the Schools to help local staff integrate scratch cooking into their menus. The nonprofit DC Central Kitchen already serves largely from-scratch meals—like barbecue chicken or tofu with beans, collard greens and cornbread—at the 15 DC schools where its staff manages the school lunch programs. On average, more than half of those meals also are sourced locally, and the District requires all of its schools to source at least 20% of their food locally. Chef Guas receives help from his son, Kemp, who competed on Top Chef Junior in 2016. David Guas, the father of 16- and 14-year-old sons, has been working for years on school food through programs like Real Food for Kids, which brings food education into schools. When Guas leads salad bar demos at Fairfax County schools, he talks about looking for a variety of colors in the produce aisle that can be added to greens. “Once they’re invested in shopping, they get more excited about what they’re eating,” said Guas, who incorporated a variety of colors into his lunch dish. He piled a red-bean hummus onto slices of honey-whole-grain bread and topped them with quick-pickled radishes, cucumbers, carrots and alfalfa sprouts in an homage to trendy toast-as-lunch. Guas topped it off with a salad of tender greens, canned tuna and chive vinaigrette with herbs from the school’s garden. Ballard said the meal seemed realistic, since schools often use beans, hummus and canned tuna as protein options, but might be adapted as a wrap that kids could eat more easily (adults still liked the idea of toast). She also said García’s beef-stew tacos would be a special treat in schools that often serve beef just once a month and reduce prices on other meals to make up the difference. Chef Ma and plating with the help of his daughter Charlotte. Chef Tim Ma was already intimate with the challenge of funneling good food into kids, including his own, ages 7, 5 and 3. When he cooks at home like he might in his restaurant, Kyirisan, or at the Eaton hotel and coworking space where he’s executive chef, Ma gets turned down flat. That doesn’t mean he won’t push the envelope. For the cook-off, Ma riffed on duck à l’orange by tucking bits of duck confit into a Savoy cabbage salad with sesame-ginger vinaigrette, pickled carrots and shallots. Spaghetti squash quickly roasted with thyme and oil was forked into a noodle-like mound with thinly sliced red onion and salt. The panel of judges assemble to taste the chefs’ redesigned lunches. Along with a panel of judges, we asked the chefs’ kids to taste the dishes, and Ma’s was their favorite (granted, three of the six kids were his, but one was too young to taste). The judges—who graded the dishes on taste and ease of execution—said duck confit, good as it was, would be tricky to work into a school menu, even if it were made in-house and served in small portions to cut costs. 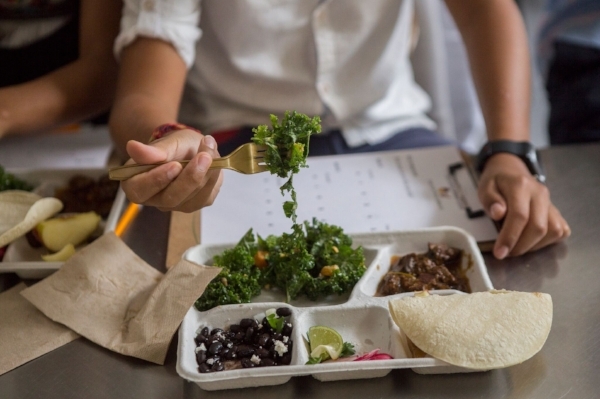 When all the points were tallied, García’s build-your-own tacos came out on top, looking the part of a school lunch with side dishes to fill every nook of the school’s compostable trays. García is putting his school lunch lessons to good use. He’s helping DC Bilingual Public Charter School, which has long had its school lunches catered, put the finishing touches on a kitchen that will support from-scratch cooking starting this fall. So, yeah, he might have had a little extra practice—even if his sous chef’s plating pace can use some work. Parents, take heart. It’s only a matter of time before all the kids in Fairfax County Public Schools will be eating more salad (or at least something off the salad bar). The district is a couple years into a five-year program that is bringing salad bars to each of its 141 elementary schools by the spring of 2021. When they roll into schools, the pint-sized bars appear before the usual lunch line, and students have the option to fill a portion or all of their tray with the greens, fruits, vegetables and proteins they provide. The bars allow schools to meet federal nutrition guidelines for fruits and vegetables in a way that makes choosing and consuming them more fun for students. Many of the schools previously offered fruits and vegetables, such as canned green beans, in pre-portioned cups and after they had filled their trays with hot food. That approach left many students adding the vegetables just to comply. The chefs came up with a variety of dishes for our challenge. “Being able to provide these options and allowing students to decide for themselves is huge,” said Morgan Maloney, food services program specialist for Fairfax County Public Schools’ food and nutrition services. Kevin Morris, assistant principal at Groveton Elementary School, which got its salad bar this past school year, agrees. The heat-and-serve model has long contributed to the poor reputation of school lunches. But there’s a reason it persists: from-scratch cooking on a school budget with a staff and students that are used to the old way is hard. Just ask Kelsey Weisgerber, food initiative and wellness manager at DC’s Mundo Verde Bilingual Public Charter School. When she arrived at the elementary known as the city’s first “green-focused” charter school two years ago, her job was to transform the lunch program and completely revamp its kitchen to support from-scratch cooking. That would mean more chopping, more canning, more breading and baking—and a new kitchen and staff to make it happen for a school that previously had relied on a vendor to run school lunch. For the new hires, Weisgerber turned to the restaurant industry and found Dorothy Steck, or “Chef Dot,” who hailed from stints at Mexican eateries and helped open the U Street tavern Hawthorne DC as chef. After fundraising and construction, the new kitchen opened just after Christmas break. Now, Chef Dot gets to interact with her customers more, as students filtering through the line let her know what they thought of lunch—either with their words or their waste. Lucia García helps prepare a kale-and-sweet-potato salad. Food waste isn’t entirely wasted, though, at the school that works to integrate what’s eaten throughout the learning experience. Garden educators work with students at the source in the school’s front-yard growing areas, where compost lessons are also in the curriculum. In a room off the kitchen, a wall-sized calendar depicts an eight-week rotation of meals planned with the help of the school’s nutritionist, who makes sure they meet daily and weekly federal nutrition standards—and aren’t impossible to execute (like the flaky fish sticks that proved difficult to bread and bake quickly). That doesn’t mean they have to be boring. Pushing aside an impossibly high mound of onions she was prepping for upcoming meals, Chef Dot ticked off some of the kids’ favorites: from grilled cheese to seafood étouffée, empanadas and tamales to tofu stir fry with rice noodles and vegetables.